SISTER Ursula O’Rourke has a job that takes her to the depths of the mystery of Christ. She’s one of two women on the formation team at Queensland’s Holy Spirit Seminary at Banyo, and she specialises in liturgy. That means she has a hand in preparing future priests for a key role in their ministry – the celebration of the Mass. After almost four decades being involved in liturgy formation and education, Sr Ursula said she had experienced the power of liturgy, the power of ritual, at work. “That’s power in the positive sense – the richness of it that can touch people’s lives at different times,” she said. Sr Ursula said that happened when liturgy was celebrated well, the way the Church intended. “It’s the Church’s liturgy – it’s not our own … But, if it’s celebrated well, if those who are leading it are prepared well for it (people experience the power and richness of the liturgy),” she said. “That’s what I try to say to the (seminarians) here – ‘You’re the instrument to enable the Church’s rituals to be experienced’. That fuels her passion for liturgy and for leading others to discover its richness. She’s talking about profound mystery – “the mystery of the liturgy, and it draws us into the mystery of Christ”. “We’re celebrating the presence of Christ but we’re also being drawn into the mystery of Christ …,” she said. “The liturgy documents talk about that the liturgy’s ‘the source and summit of the Christian life’, and that’s not just an optional extra, but it’s right at the heart of who we are. “That’s what I try to say to the fellows here – it’s meant to permeate our lives. Liturgy is not the field she chose for herself but others chose it for her. As a young woman, born in Townsville and having grown up in Brisbane where she was taught by the Good Samaritan Sisters, she joined the order wanting to be a teacher. 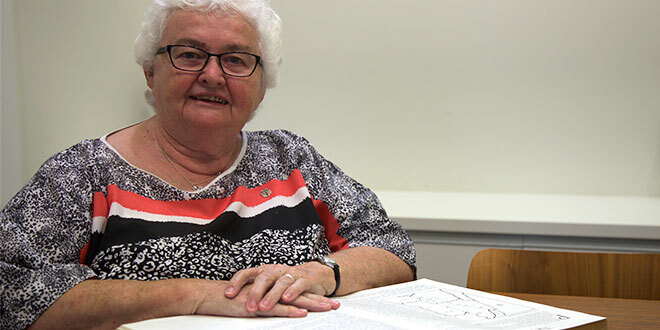 Fifty years ago, following her final profession, she began a teaching career that would take her to schools in different parts of Queensland – Innisfail, Toowoomba and Brisbane and then went back to Townsville. She was happy and fulfilled living the religious life with a group of women who had inspired her in her youth. “I was taught by the Good Samaritan Sisters in both primary and secondary school. I had good teachers; I had women who I looked up to,” Sr Ursula said. She was also influenced by the strong faith of her parents and her family. “I’m the eldest of eight and we had a strong living of the faith in our family” she said. Involvement in the Young Christian Workers also influenced her through its focus on reflecting on the Gospel, “living out the Gospel in one’s life, serving people, reaching out to people, responding to people’s needs”. The Good Samaritans were her choice not just because they were the only order she had known. Sr Ursula also was drawn to them because they were an Australian order and because “there was something about the inner strength of some of these women”. “There was something about them; they were very down to earth,” she said. Sr Ursula was principal of St Margaret Mary’s Primary School in Townsville when she was steered towards liturgy. “My provincial at the time asked me if I’d be interested in doing a course in liturgy which was run (in Brisbane) – at the Institute of Pastoral Liturgy – it was run out of the seminary,” she said. She accepted the invitation, but only on the proviso that she be allowed to return to her school after the four-month course. That was in 1982. “While I was here (at the seminary), Bishop (Leonard) Faulkner, who was the Bishop of Townsville at the time, through the encouragement of provincials, asked me if I’d be prepared to finish school and take on a role in the diocese, as the director of liturgy,” she said. Liturgy had never been an area Sr Ursula had imagined pursuing. “I’d always had a great love for the liturgy but I hadn’t thought about doing any study in it, and then when I came to do the course here at the Institute of Pastoral Liturgy something clicked with me there, and I thought, ‘Oh, I’m really loving this’,” she said. “But I didn’t think anything was going to come out of it. “Maybe it was the vision of Bishop Faulkner at the time that this is what he wanted … and the fact I was actually teaching in Townsville at the time, so I knew the place, I knew the diocese. She went on to complete a Graduate Diploma in Sacred Liturgy from the Irish Institute of Liturgy, at Carlow, Ireland, and a Master of Arts in Liturgical Studies from the University of Notre Dame, Indiana, USA . She’s worked in liturgical education and formation around Queensland, and lectured at the former Brisbane College of Theology and at Australian Catholic University. She’s a former member of the National Liturgical Council and the Australian Catholic Bishops’ Commission for Liturgy, and remains a consultant to the council. Sr Ursula started teaching the seminarians after former rector now Bishop Tony Randazzo asked her “to come to be part of life here in the seminary”. She could not be happier. “I feel very privileged,” she said. “As formators we often say, ‘We’re in a privileged position … in the sense that it’s like being on holy ground. You’re kind of seeing the growth in these young men’. In liturgical formation, Sr Ursula’s aim is to impress on the future priests that “when they’re ordained ministers, their role in leading the liturgy is about how can they enable the people to celebrate in the best possible way”. “I often say to them, ‘When the liturgy is celebrated well, in the way it’s meant to be celebrated – not all the balloons and whistles and all that, but the way we’re meant to celebrate it – that’s the best educator. You don’t have to explain to people anything, because they’ve been drawn in to the experience’,” she said. “That’s what I try to instil in them here. “They start to see the importance of it – the way they preside, the way they pray the words, all that kind of thing, is so important to engage the assembly in the prayer. “It’s not about them personally. Her key message to the seminarians is “that they have a love for the Church’s liturgy, (and) that it’s not about just going through the mechanics of it – that they have a love for the liturgy – that as future presiders of the liturgy, that they’ll be immersed in the spirit of the liturgy, that they will always be aware that they’re kind of the instrument through which people can be immersed in the mystery of Christ”.